Experience the sights of Philadelphia with a personal guide on this private, half-day sightseeing tour. Hop in a comfortable minivan (for up to six people) and ride from river to river. 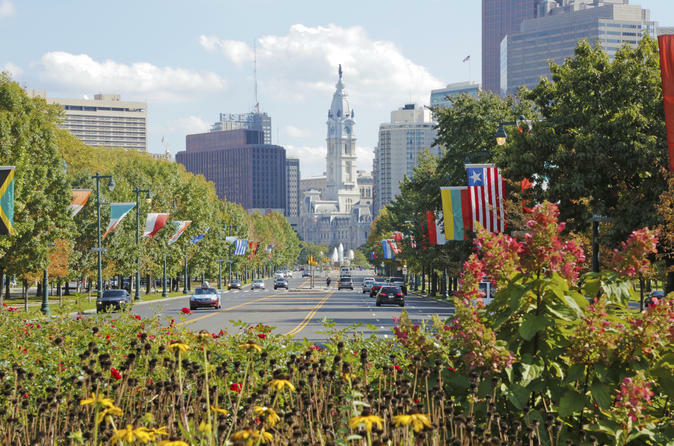 See the Historic District, Penn's Landing, the Italian Market, Philadelphia City Hall, the South 9th Street Italian Market, the Rocky Steps at the entrance of the Philadelphia Museum of Art, and much more. This private, half-day (4- or 6-hour) driving tour begins with a local hotel pickup in a comfortable minivan. See many of the must-see highlights in Philadelphia, plus a lot more. Let the guide show the way, but feel free to request any specific attractions or landmark locations of interest. Visit all the must-see spots, as well as lesser-known neighborhoods. Drive through the colorful South 9th Street Italian Market, getting out of the van to visit the Liberty Bell, an iconic symbol of American independence. Drive past the imposing Eastern State Penitentiary, where Al Capone was once held. Also, see Penn's Landing and Philadelphia City Hall, and climb the Rocky Steps at the entrance of the Philadelphia Museum of Art. The tour ends with a drop-off at any Philadelphia hotel or destination.